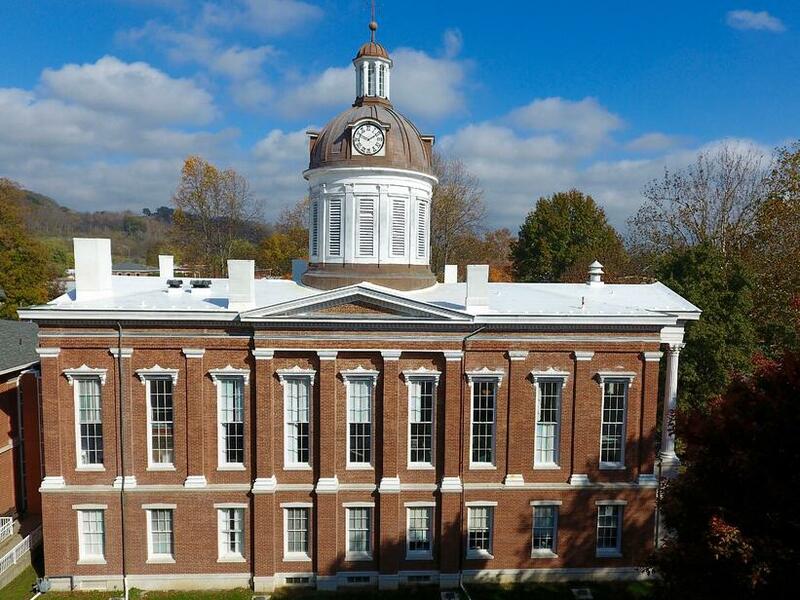 The Switzerland County courthouse in Vevay, Indiana was built in 1864. The courthouse is still the current location for court hearings. The historic structure is equipped with very tall ceilings and ornamental trims, decorating the inside of the courtroom. 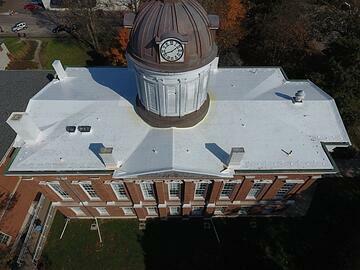 The county commissioners in charge of maintaining and preserving the building started to notice that the existing rubber roof was starting to fail at the seams and leaks started to appear. They began to realize that the flat roof would soon need to be repaired. 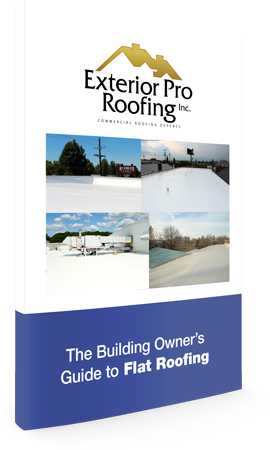 The existing rubber roof was put on in the early to mid 1990's and had served its purpose, but not without costly maintenance repairs. 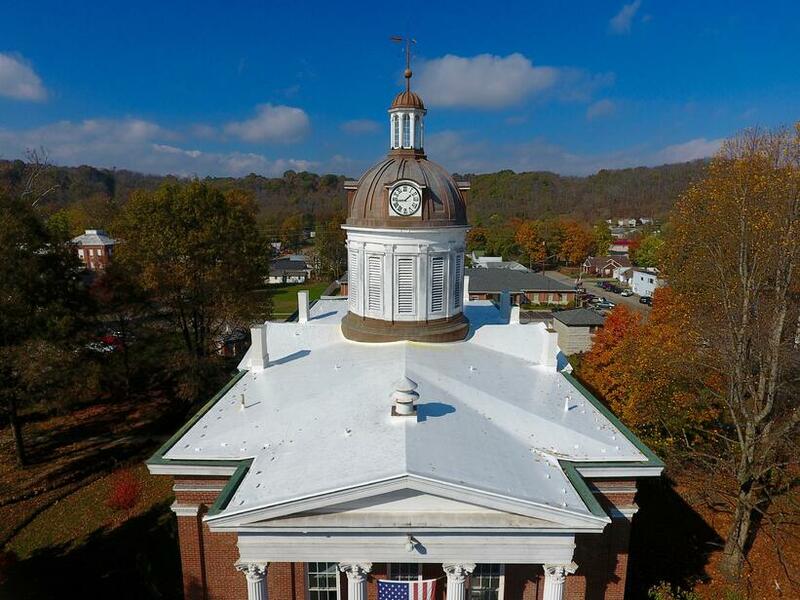 The rubber had developed recurring leaks that were repaired, however, with each repair came a bill that the Switzerland County commissioners felt were wasting scarce maintenance funds on an all together bad flat roof. 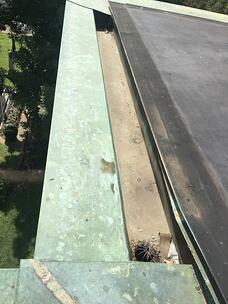 Exterior Pro Roofing met with the commissioners and proposed a permanent fix for the leaking flat roof. The proposal would involve minimal disruption for any court hearings that would be taking place during the repairs. The proposal also included affordable pricing for the county's current operating budget. 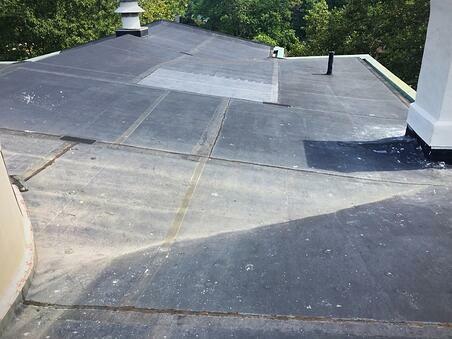 Exterior Pro recommended that the existing rubber roof be recovered using a white PVC membrane from Duro-Last. Duro-Last is a roofing material that has been engineered to recover already existing flat roofs. The current rubber roofing had good insulation underneath. 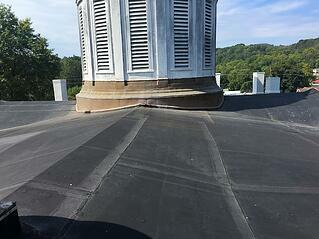 Since the current insulation was in good, usable condition it was unnecessary to tear off the old rubber roof. This lowered the cost substantially for the proposed project. The entire project took just one week from start to finish. The crew at Exterior Pro worked hard to keep the roofing project moving, but more importantly, they worked smart. The job progressed just as planned and on Friday the Duro-last third party inspection was completed and the warranty for the new flat roof was issued. The Exterior Pro installation crew scored a 96 of a possible 100 points during the inspection and are very proud of the excellent work completed. 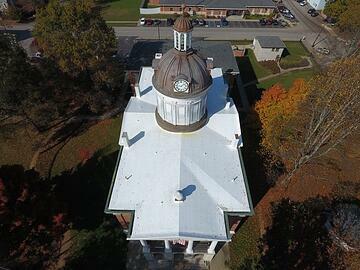 The new flat roof on the Switzerland County courthouse will keep the historic landmark protected from weather for the next 20 + years.